Transfer from Bari airport to typical “ Masseria”. Check-in at your accommodation. Relax in the afternoon discovering the beauties of the “Masseria”, such as the pool, beach, well equipped spa, golf and finishing with a relaxing dinner at leisure facing the wonderful “apulian” sea and overnight stay. Depart for an amazing visit to the “ Castellana Grotte”. 3km long and lasting about 2hours, reaching the Precipice Cave, and then the farthest cave of the complex. The White Cave, referred to as the "whitest in the world" is so called because of its hard solid mass. which are ancient little white buildings made of stone. These characteristic wards of the Trulli stretch all around the centre of the country. The monumental Zone, which is a Unesco site acknowledges the presence of the wards Monti e Aia Piccola, wholly composed of "trulli". This pleasant quiet walk takes you to the top of the ward Mountains. From this point there is a unique and alluring landscape. You can enjoy lunch in a typical restaurant of the area, then return to the hotel in the afternoon and overnight. After breakfast, departure to Ostuni. 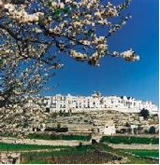 The so-called "Old Town" is Ostuni's citadel built on the top of a hill and still fortified with the ancient walls. Ostuni is reputed an architectural jewel, and is commonly referred to as "the White Town" ("La Città Bianca", in Italian) for its white walls and its typically white-painted architecture. It will be an amazing experience to have a cooking lesson in a typical restaurant and spend half a day learning how the local chef cooks home –made pasta “ Orecchiette with broccoli “ a must of the apulian food and other typical recipes. You will enjoy a delicious lunch which you have prepared. In the afternoon, you can take a relaxing walk through this smart town, its narrow streets and shops. Back to the hotel for overnight stay. After breakfast, depart for a day spending time driving through the characteristic villages of the Valle d’Itria. First stop is Martina Franca, a smart town settled 431 metres above sea level, lying over one of the last southern hills in the south-east of the Murgia area. It overlooks the charming Valle d’Itria. The main attraction of the town is definitely the old town centre, a typical example of baroque art, with its smart streets, its white lanes, its elegant mansions and its stately and monumental churches. Stop for lunch in a restaurant in the old centre and then, proceed to Cisternino, a small and elegant town spread over a green hill, refined by the typical Trulli. There is a short walk along a suggested labyrinth of white lanes above which little arches stand. Here you can get a chance to see some of the different artistic beauties of the wonderful old town. Last stop it will be in Locorotondo, declared the "most beautiful villages of Italy” with its dazzling white houses, green olive groves and vineyards which all work together to make this an unforgettable tour. After a walking in the old part of town, renowned for its circular lay out, we suggest you stop in a famous vineyards tasting DOC local wine and visiting cellars. Then back to the hotel and overnight stay. Depart to the airport of Bari.